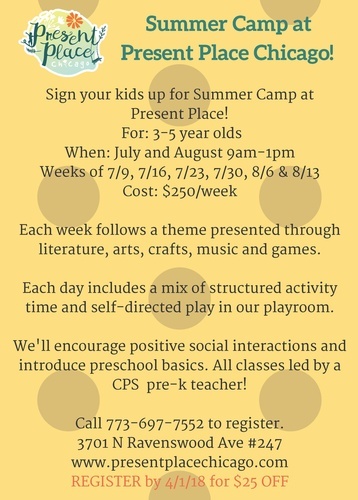 Sign your kids up for Summer Camp at Present Place! Each week follows a theme presented through literature, arts, crafts, music and games. Each day includes a mix of structured activity time and self-directed play in our playroom. We'll encourage positive social interactions and introduce preschool basics. All classes are led by a CPS Pre-K teacher! Register by 4/1/18 for $25 off!